There was great excitement around the school today, when a very special visitor arrived laden down with gifts for all the boys and girls. 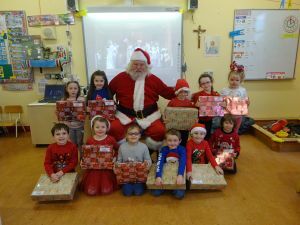 Click on the link below ‘Santa pics’ to view pictures. Last Thursday the boys and girls performed their Christmas plays to a packed hall. They were fantastic and set a really high standard. Well Done to all our budding actors and actresses. We hope everyone thoroughly enjoyed the night. Copies of the school plays will be available shortly. More details to follow. Click on the link below and see if you can find yourself in any of our pictures. All roads lead to Firoda National School this Thursday night. The boys and girls have been busy rehearsing for their annual Christmas Play for the last few weeks. They cannot wait to show off their acting and singing skills. It’s a show not to be missed. Kick off commences at 7:30. Don’t be late! 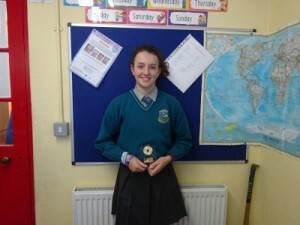 Congratulations to Holly Byrne who recently competed in the Leinster Handball Championship held at Mullinavat. Holly was victorious in the U12 B singles 60 x 30 competition. Well Done Holly! 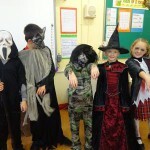 The boys and girls had great fun dressing up today in their Halloween costumes. Click on the link below for all the pictures and see if you can find yourself. We hope everyone has an enjoyable Halloween break.